H. R. V. O .C. A while back some people from the TCEQ had the idea that cooling towers were emitting enormous amounts of harmful substances to the air. The thought was that if any heat exchangers were to get leaks and release product into the cooling water that it will flash off into the air. Which it will. They also wanted everyone to measure and account for any and all substances burned on the plant flare. First question for you my students, does Louisianna plants have to monitor their cooling towers and flares? 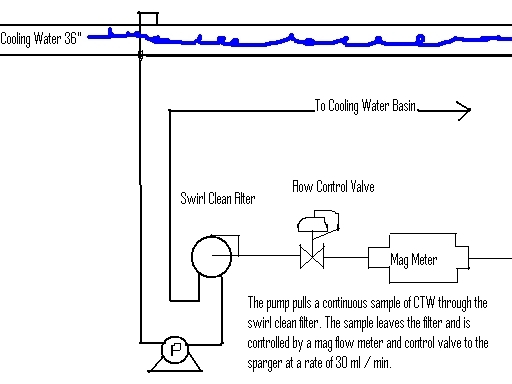 Let's discuss how we will use a sparger to sample the cooling tower water and send it to a G.C. to be analyzed. 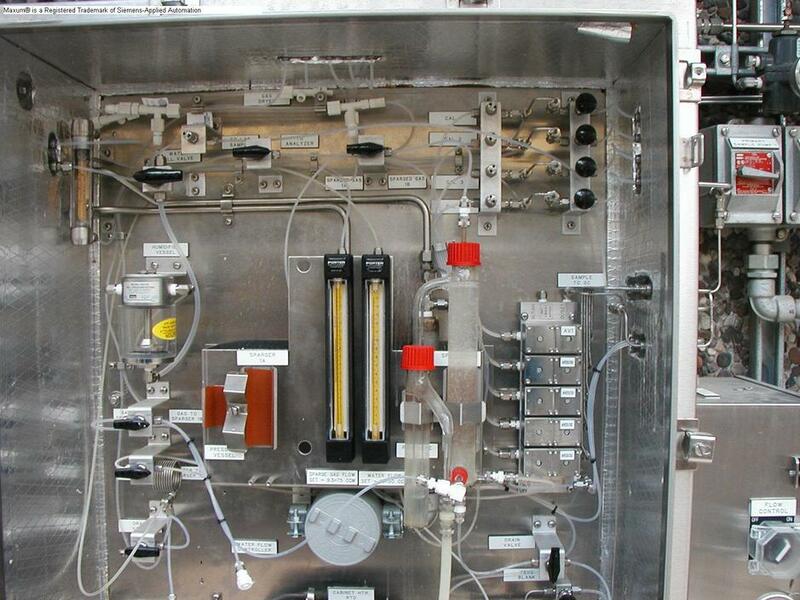 From the flow controller we have a continuous flow of CTW into the sample box on the lower right side. The sample is pushed up through a water heater maintaining a temperature of 40 Deg. C. The water runs through a rotometer and then to a three way valve where we chooce to send the water to the right or left sparger. The continuous flow fills the sparger and over flows to the pressure vessel which maintains a constant level and thus a constant back pressure. The cooling water then overflows back to the CTW basin. At the bottom of the sparger we introduce the sparge gas of Helium. The Helium is pushed at a constant rate through a fritz which basically makes a it turn into small bubbles. 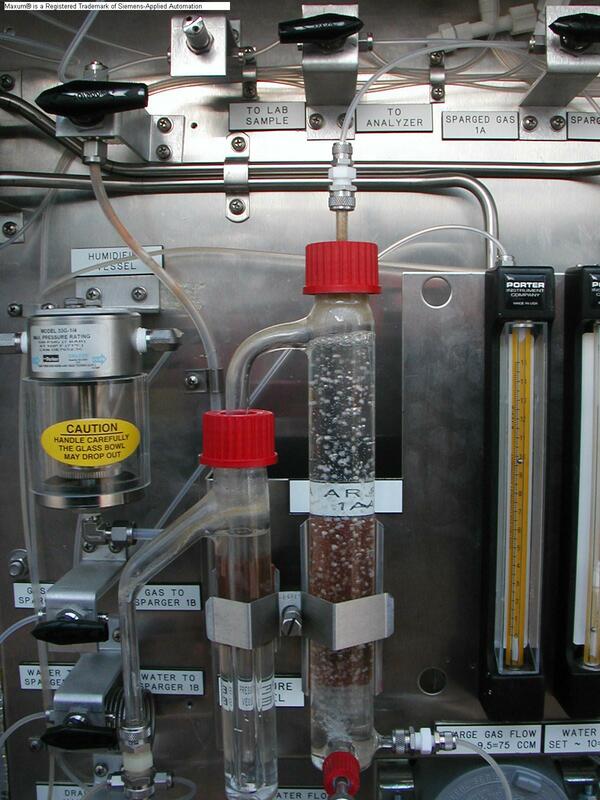 These bubbles attach themselves to any hydrocarbons in the CTW and then carries them out the top of the sparger to the analyzer. Each analyzer run takes 442 seconds. 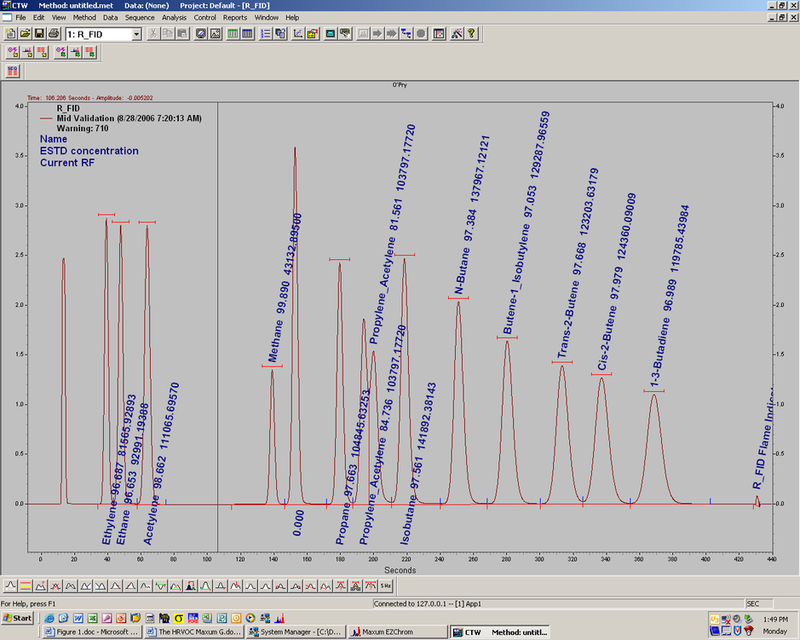 The analyzer then seperates out the components and measures them. Then starts all over again. The system works very nicely but is dependant on us making sure that the constants remain constant. 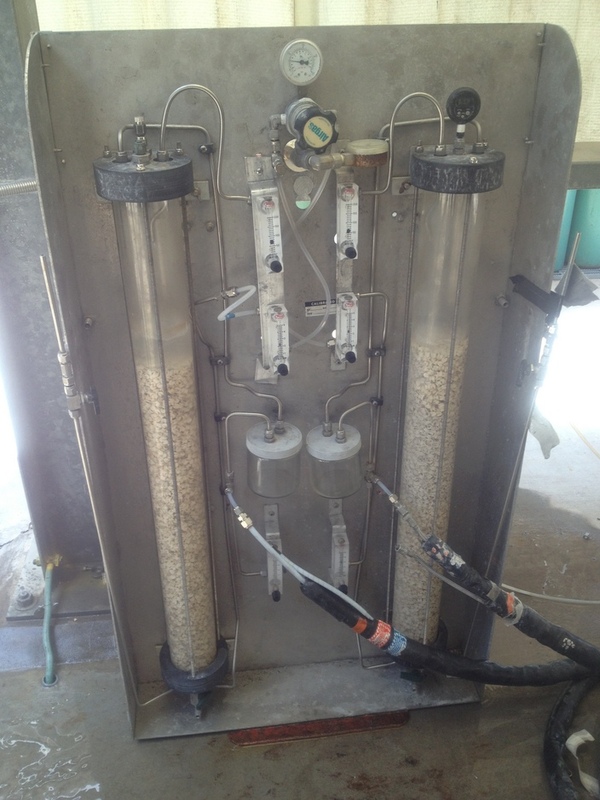 Water and sparge gas flow control can be done a many of ways. From a PID control valve and mag meter on the water with a smart flow transmitter on gas. To the poor man way with a regulator and rotometers and coils of tubing and such things like that which you will fight all the time to stay constant. Why will a .05 not work?? The object of a swirl clean is to do what? 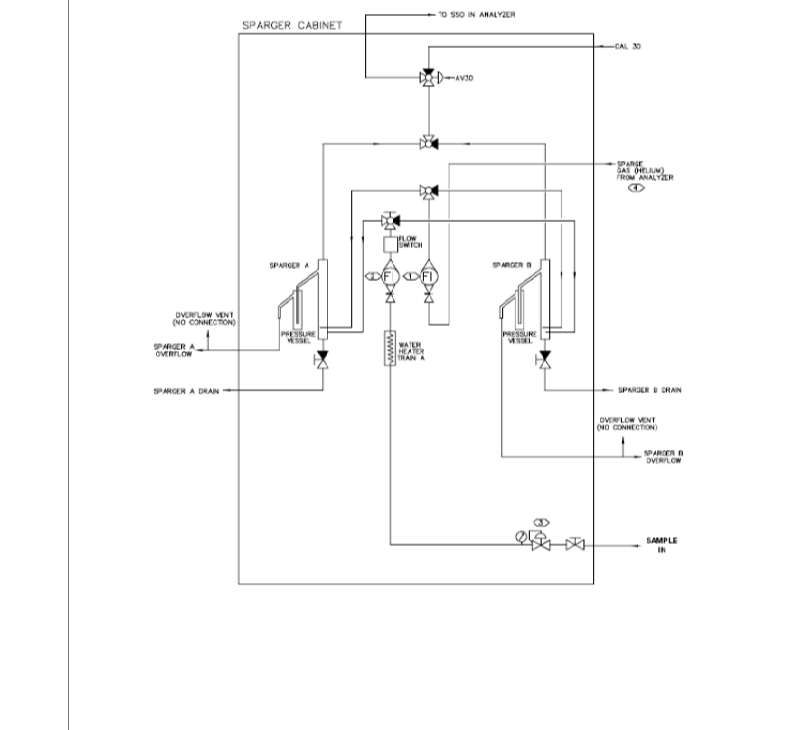 I think you can see the basic concept to how this works after being explained the sparger. A couple of things about these that you need to know. The small ceramic pieces inside of this are called saddles. El Paso Strippers must be pulled and cleaned and then ran and certified that there are no hydrocarbons present. I'm sure how often this has to happen but I believe once a month. This is a very lucrative business. I must mention here also that sometimes we look for components but just because we want to know, not because they are on the bad list. Here is an example from a cooling tower and all the components they are looking for.